The new beachfront lifestyle resort, Samabe Bali Suites & Villas, is very proud to introduce our General Manager, Mr. Ralf Peter Luthe. Raised in a family of hoteliers back in Germany, Mr. Luthe has been familiar with hotel environment since very early on. Young Mr. Luthe used to help around whenever help was needed in the family-run hotel, from washing dishes to peeling onions. He was only 15 when he decided to leave school and start earning his own living. His professional hotel career started with Four Seasons Munich where he learned all the basics of luxury resort operations. Five years afterwards, at age 20, he left Germany to join luxury hotel chains in London, Paris, Abu Dhabi, Singapore and Thailand. Mr. Ralf Luthe arrived in Bali in 1987 to work for Putri Bali Hotel as a chef. In 1990 he moved to Grand Bali Beach and worked for a year before he was transferred to Manado as Food & Beverage Manager. In 1992 he was transferred back to Grand Bali Beach and expanded his career as F & B Manager and Resident Manager. In January 1993 Mr. Ralf Luthe accepted a new challenge and showed his savvy prowess as General Manager of Grand Mirage Resort & Thalasso Bali for over 18 years, during which the resort made a lot of accomplishments; the latest was winning a Pacto Award for Best Seller 2011 for Resort Category. In late 2011, Samabe Bali Suites & Villas – Grand Mirage's sister property – offered the zestful gentleman an opportunity to lead the opening team and operate the new Bali 5-star luxury resort. Owing his many years of living in Bali, Mr. Ralf Luthe, who loves walking, swimming and tennis, has grown a strong passion of the Balinese culture and considers Bali as home. Balinese hospitality is one of the strong highlights that guests will experience at Samabe Bali Suites & Villas. "I want to give our guests a top 5-star luxury experience," Mr. Luthe said. "At the same time, I'd love to invite them to uncover the ancient secrets of Balinese culture." In this spirit, a wide selection of Balinese cultural leisure activities have been designed to bring guests closer to the Balinese culture, arts, tradition and sacred rituals. 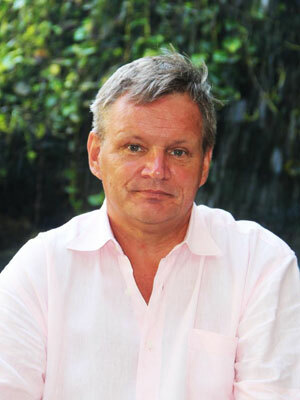 Mr. Ralf Luthe, now 52 years, has a wonderful Balinese wife, a daughter aged 4, and a son aged 15, whom he gives freedom to decide for their future careers. As for the new resort, he earnestly said, "I will pour my 24 years of experience in Bali into Samabe." Under his leadership and craftsmanship, Samabe Bali Suites & Villas could expect an up-and-coming future.